Join the first edition of Bolivia’s biggest conference on Angular and web technologies, taking place August 3-4 in Cochabamba. 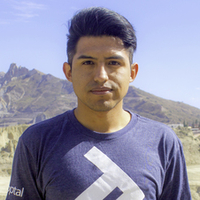 The event is a great opportunity to meet Edwin Guzmán, a Toptal developer and Community Leader, who will be on site for the conference. Meet up with Edwin to learn about how Toptal works, or to introduce your colleagues who may be interested in finding out more. For more information and to RSVP, please see the event website or contact Edwin directly. Your message to Edwin was sent.